Well, I've finally admitted what's been obvious to some of you for a while now. Having 2 babies in 17 months has cramped my former style to such a degree that not only do I not have time to post to Lex Culinaria, even when I do, I don't have anything to post about. Don't get me wrong, I love my babies, and I love being a mum, but let's face is, right now, my life is about mac-n-cheese, not cheese souffles! I've started a new blog which is more mac-n-cheese and paddling pools. You can check it out here. I loved doing Lex Culinaria, and I'm sure I'll love the new blog too. Lex Culinaria will still be here as an acrchive (please bear with me as I fix the formatting - I buggered it up when I configured Moms' Idea Factory!). Thanks for 5 years of awesome comments and feedback. Two exciting things happened last week. Silas turned one and I learned how to make my own fondant that doesn't taste totally gross. I hate traditional fondant. It`s kind of sickly and pasty and fake tasing all at once. This stuff is not only miles easier to make, but is actually pleasant to eat. Which is a really good thing as I am not all that skilled with buttercream icing. When I make cakes only with buttercream, they look like a 3-year old decorated them. 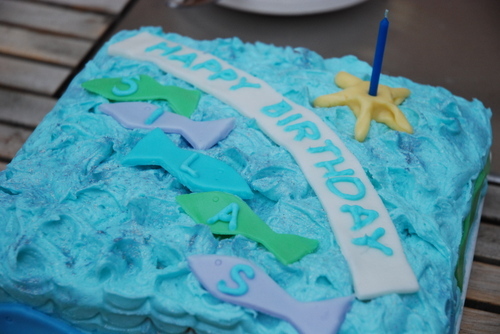 And I did not want people to think I made Silas ice his own cake. I got the recipe here, but if you google ``marshmallow fondant``, you`ll find heaps of recipes, all essentially the same. Don`t worry about the marshmallow being too hot to work with your bare hands. Marshmallow melts at a very low temperature so, unless you totally overcook it, you should be fine. Only one caveat: donèt try to make a 3-D sailboat out of it. It won't work. Trust me. Well I guess it's only 1 mile technically if you count the distance from my house to the Strathcona Farmer's market where I bought the ingredients for today's super-easy brunch. But I guess the whole point is not how far I traveled to procure the food, but how far the food traveled to where I procured it. Otherwise I could feel a whole lot better about those Philippine mangos I bought the other day. The farms where the eggs and asparagus came from are easily within 100 miles of here though. I love the idea of coming home from the farmers' market and throwing together a quick lunch out of asparagus picked fresh and eggs collected today - served alongside bread baked fresh at one of the two bakeries a half block from my house. Fresh certainly tastes better. Even the baby loved it. The baby who's going to be one on Monday. Eek. Try this out for a quick and amazingly flavourful lunch. Throw in some nice fresh dill if you've got it. Don't forget the bread to soak up all the lemony buttery juice left on your plate. And make sure you eat it outside in the sun. Snap the ends off the asparagus and rinse well. If it's quite gritty let it soak for 10 minutes in warm water and then rinse well. Melt knob of butter in a frying pan over medium-high heat. Lay the asparagus spears in hot butter and drizzle over water & lemon juice. Use tongs to move the asparagus back and forth in the steam and melted butter until asparagus is cooked but not floppy, about 6-7 minutes. Set aside. In a large-ish pot heat about 3 inches of salted water until it is just barely bubbling. Poach eggs according to these instructions. While eggs are poaching, whisk butter and lemon juice together in a small bowl. If you can't get it to blend, pop it in the microwave for 3-4 seconds. You should be able to get it to blend, and stay suspended, nicely after that. Stir a bit of salt & cracked pepper and chopped dill, if you are using it. Set aside. Use tongs to arrange asparagus on each of two plates. 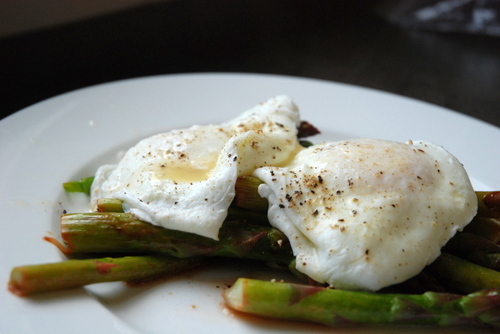 Top with poached eggs and drizzle over sauce. Remember the bread or risk horrifying your husband by licking your plate. Not that anyone I know would ever do that. I'm just saying. I found a great little tool that lists all the farmer's markets in Edmonton (or anywhere else in Alberta if you ask it to) complete with hours of operation & a map to get you there. 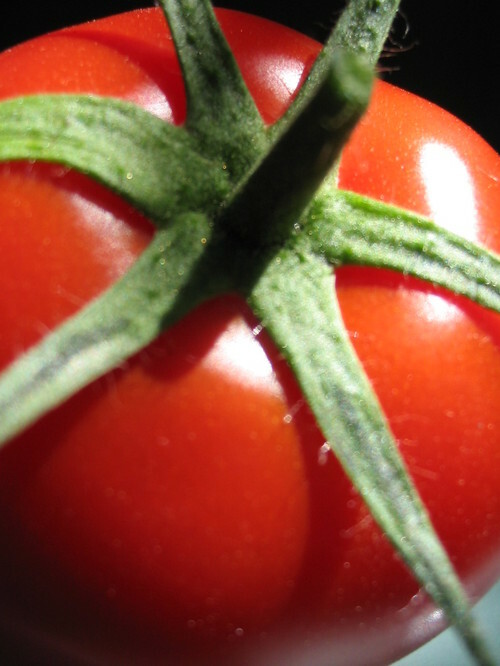 How easy does that make getting great local produce? Since having Baby Cakes, I've discovered that popping out to the grocery store is not the easy task it used to be. 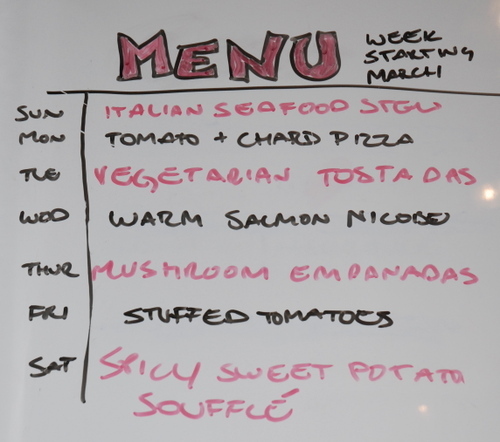 In an effort to reduce the numerous trips to the grocery store necessitated by my tendency to cook whatever I want, whenever it suits me, I'm experimenting with setting weekly menus that I can shop for all at once. So far so good. I've avoided repeated trips to the grocery store and have tried out a few yummy new (fast!) recipes. 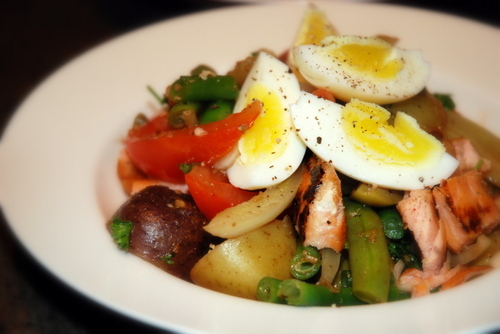 Last week, among other things, I made a really delicious & simple salmon Nicoise. The fact that it's pretty healthy too is just a bonus. You can serve it warm, as I did, or chilled. It tastes even better the next day, so would make an excellent brunch dish or packed lunch. I didn't do a traditional Nicoise salad dressing with anchovies because I had just made up a huge batch of this dressing for having on hand, and it went wonderfully. This one is definitely going in the rotation! (90 ml) 1/3 cup of Glen's Mama Ro's Wicked Salad Dressing. Put a cold pot of salted water on the stove and place the eggs in it. Bring it to a boil, cover with a lid and remove from heat. Allow to stand for 9 minutes. Remove the eggs from the water. Set aside. Return hot salted water to stove and bring to a boil again. Drop halved potatoes into the boiling salted water. After 5 minutes drop in sliced fennel. After 5 minutes more, drop in green beans. Reduce heat and simmer 5 more minutes, or until potatoes are cooked through but still firm and fennel and beans are also cooked. Drain vegetables and rinse under lukewarm water to stop the cooking, but allowing the vegetables to remain warm. Toss in a bowl with the onions, parsley, olives , capers and tomatoes. Toss with dressing . Set aside. Peel cooked eggs and slice lengthwise into quarters. Set aside. Heat a large nonstick pan, sprayed with oil, over medium high heat. Cook the salmon steaks on each side until cooked, about 8 minutes, depending on the thickness of the fish. sprinkle fish with salt and pepper and squeeze lemon over it. Spoon marinated salad onto 4 salad plates or soup plates. Chop or break up the cooked fish and distribute over the tops of the salad. Top each serving with 4 quarters of egg. Last weekend I splurged a little and bought 4 new cookbooks. Of those 4, three were from the Williams-Sonoma Savoring series. I promptly sat down and flipped through each. Halfway through the Appetizers book I spotted a vegetarian tostada recipe and decided it was going to be dinner one night this week. Never being one to feel constrained by someone else's recipe instructions, what I made was a bit different from what was written in the book, but it did turn out beautifully and, despite the amount of prep-work involved in dicing and cooking 8 assorted vegetables separately, I reckon I'd make it again in a heartbeat. The sauce isn't spicy at all, but has a great Latino chili flavour. If you can't find dried Latino chillies where you are, you can order them online for next to nothing. Although, if you can get them in a place like Edmonton, you can probably get them anywhere. Trim stems off the chilies, cut in half and roll them in your fingers to dislodge most of the seeds. Place them in a shallow bowl and cover with boiling water. Allow to soak 20 minutes. Drain and reserve water. Place soaked chilies and the remaining sauce ingredients in a food processor, mini chopper or blender. Whiz to form a sauce, adding as much additional chili-soaking water as needed. Strain through a mesh sieve and set aside. Make sure all your veggies are diced roughly the same size. Bring a medium pot of salted water to a boil and set a large metal bowl full of cold water to the side. Cook diced potatoes for 5 minutes, use a slotted spoon or small sieve to transfer them to the cold water to stop their cooking. Repeat with green beans & carrots (4 minutes cooking time) and zucchini, sweet potato, chayote (3 minutes cooking time). When all veggies have been cooked and cooled, drain and dry on a kitchen towel. Toss with tomatoes, onions and sauce, set aside. 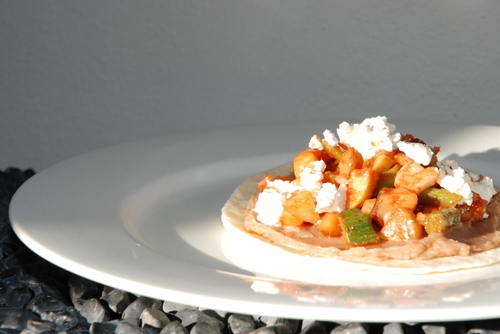 Spread each tostada/tortilla with a tablespoon or two of beans, top with a mound of vegetables and sprinkle over some of the cheese. Serve cold. Since we had the baby I've become keenly aware that practically everything we eat, sleep in, drink from, floss with or inhale is toxic. We're bombarded daily with the message that everything we do (and above all everything we eat) is bad for us and we'd best make sweeping changes to our homes, work, diet etc. lest we perish horribly in the very near future. Oh, and would we please buy this uber-expensive solution to our mortal peril. I am a skeptic, especially as regards this zealous North American fear mongering about everything in existence. I am also a person who does not *ahem* take orders very well...or in fact at all. So this veritable avalanche of frequently alarmist (and not infrequently biased, green-washed) information is kind of grating on my nerves at the moment. The problem is, as a new mother you're bombarded not only by the media, but by everyone else around you. People you normally like start proselytizing about the horrors of plastic and how disposable diapers will leach dioxins directly into your baby's tender little bottom. I've had it up to the gills with hearing about this stuff and especially hearing others list off, for the millionth time, all the steps you should be taking to protect your darling. I mean, honestly, who cares if your q-tips are organic? Maybe that's why I'm having a hard time with the "V"-word. I can certainly rattle off a string of expletives that would curl my mother's hair. Well, if it weren't already curly. But I can't bring myself to say the "V"-word, lest I sound like one of those crazy Type-A Consumers who will have to take out a mortgage to pay their grocery bill because they'll only shop at a well-known lifestyle/image store masquerading as an actual healthier alternative to mainstream groceries. I buy from farmers markets, because I like knowing where my food comes from and because I think it tastes better. I am not, however, about to buy that $6 imported organic mango out of a sudden fear of pesticides because, come on - flying a fruit halfway around the world isn't exactly "organic", is it? I guess I can't ignore some things much longer though. After my husband, having perused the weekly menu up on the white-board beside the fridge, asked rather directly, "where's the meat? ", I can't help but notice that we've been eating a lot less of the red stuff and a lot more of the green stuff lately. Not that it was ever a conscious decision...it's just sort of evolved that way over the last couple of years. When I take a break, planned or not, from blogging for a few weeks, that doesn't mean I stop cooking and taking photos and tweaking recipes, scribbling on whatever is at hand. I still do all those things but, at the end of the break, I end up with a raft of intended posts and delicious photos and no idea where to start. Which is the dilemma I have now. It's been a pretty busy few weeks chez Lex & Cakes. Cakes went back to work full time at the beginning of January and I have had a crash course in caring for a very active (and darling) baby all by myself. I realize that lots of mums do this right from the get-go, but it was nevertheless a bit of a shock and a lot more hard work than I anticipated. All of a sudden, I don't have that extra pair of hands around the house & I have to live my life (and cook, and clean, and shower) in 15 minute increments. So there hasn't been a lot of time to post. I think I'm getting into a bit of a groove now though. I hope. At least until the next set of teeth come. One of the meals that's been getting made a lot around here came from the little cookbook that I put together for the ladies in my Mum's group. We all contributed a few recipes for favourite family meals and i pasted them all together in a purty little booklet. Most of the recipes (including mine!) are of the family casserole/one dish genre, which is great for mums with little babies (including me!). One of those recipes has quickly become a favourite in our house. 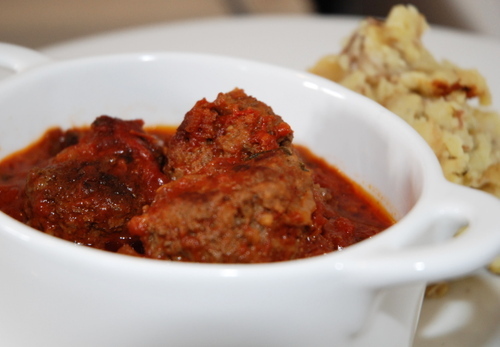 It's really exceptionally flavourful, dead easy to make and is loaded with veggies. 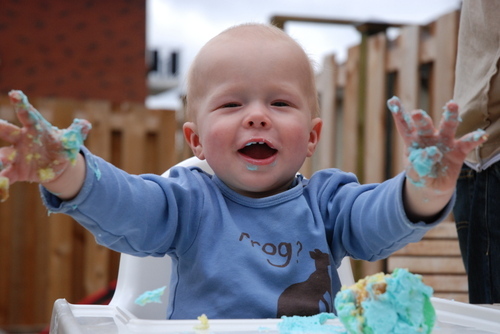 And if I mash a little with the back of my fork, Baby Cakes happily gobbles it up along with the rest of us. 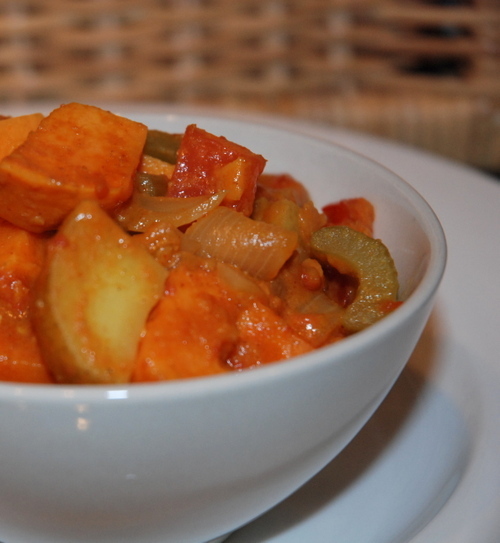 Heat olive oil in a large pot and add onion, potato, sweet potato, celery, pepper and garlic. Cook & stir for a few minutes. Add broth, tomatoes, zucchini, chickpeas and spices. Let simmer for 25 minutes. Add raisins, peanut butter and tomato paste. Cook for 5 minutes more. Stir through lime juice. Serve. 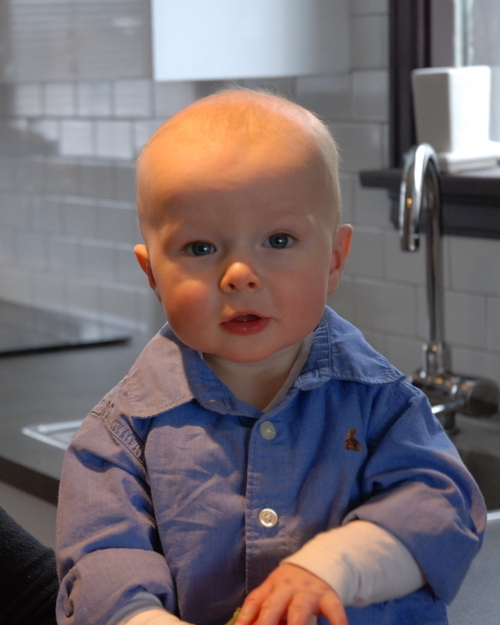 Did you think you'd escape my first post back in a while without a photo of the Baby Cakes? Silly you.